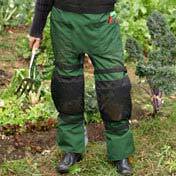 GreenJeans Gardening Chaps -- the best gardening tool you'll ever wear. Whether it's working outside in the garden or doing landscaping projects for my clients I inevitably spend a lot of time on my knees. This ends up being very hard on, not only my knees but my clothes as well. Over the years I've tried wearing knee pads, but they always seem to move from protecting my knees to getting in the way, or cutting off my circulation. I've tried using a closed cell foam pad but that too has it's down sides too, like having to move it around constantly, or it gets full of dirt and mud thus soaking my knees and wrecking my pants. 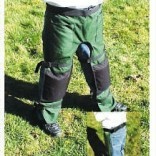 So what are the best gardening knee pads to buy? Well, not to long ago one of my Master Gardener friends provided me with the product, that not only I was searching for, but what most gardeners, landscapers, and professionals have needed for years, and they're called Green Jeans. 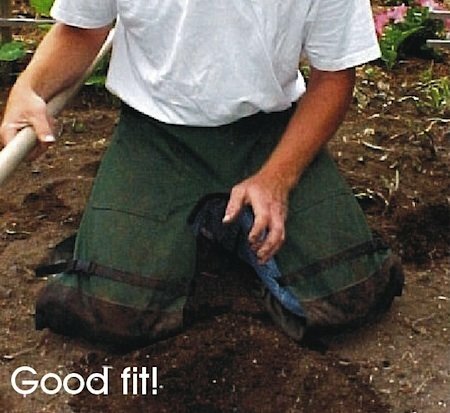 Green Jeans are, simply put, DIY gardening chaps. 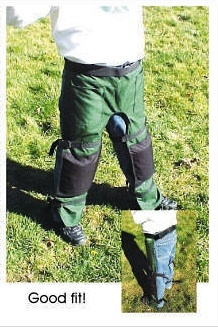 They're a pair of heavy-duty denier textured nylon chaps with built in knee pads. 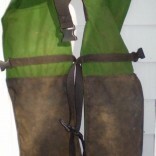 They go on and off over your pants and boots easily and quickly, and secure with easily adjustable snap buckles. Once on they're very comfortable, they protect your clothes, and best of all the knee pads stay over your knees! So no more wet muddy knees, worn clothing, or sore worn out knees. Just pure comfort and durability. The sizing chart, for ordering, matches the exact location of your knees with where the knee pads are in the chaps. The chart also takes into consideration waist size and height, so you'll get the exact fit you need. And, these knee pads won't cut off your circulation. 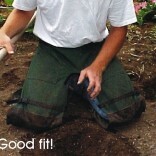 Green Jeans will allow you a worry free time working outside, save your knees, and protect your clothes. So pick up a pair, and they will surely become your favorite DIY gardening tool.